By far my favorite part of being a student in the OSU STEM Education PhD program has been the opportunities I’ve had to observe or be part of spaces of mathematics education that I’ve never been in before–this is probably most evidenced by the fact that I’m a math professor at a two-year college used to teaching calculus and statistics who is writing blog posts for an early childhood and elementary mathematics blog! What I’ve been up to the last two Saturdays also provides a good example of these broad experiences that I’ve been enjoying. 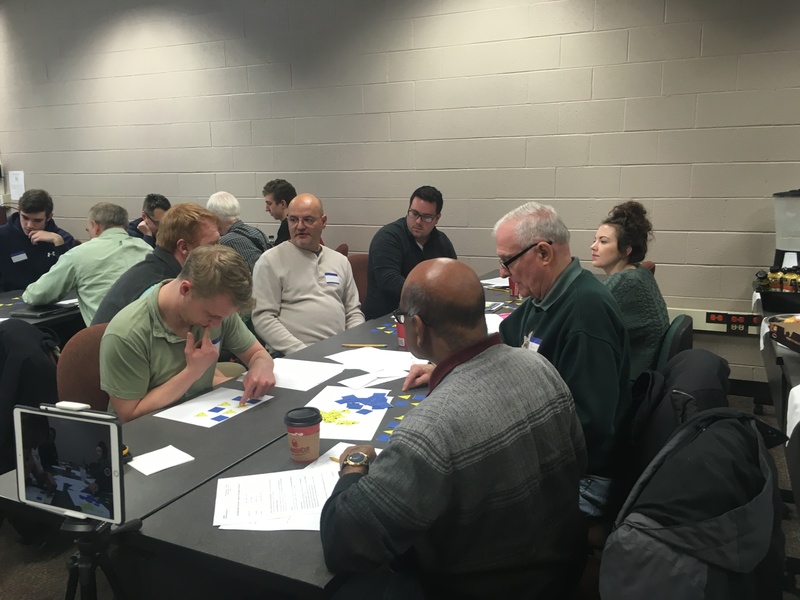 Two weeks ago I observed a professional development event for pre-school and elementary teachers from Columbus and last Saturday I planned and hosted a professional development for faculty and tutors at a two-year technical college. I thought going into these two events that they would probably be very different from each other–but instead I saw many similarities. So I’m going to take a few minutes to share the commonalities. Math is a tough subject to teach no matter what the grade level: I’ve spent my professional career teaching adults. It has been easy to assume that the challenges I face in teaching are due to the level of material I teach. Spending time with both of these groups exposed that this thinking was very flawed. Both young children and adults are capable of deep and powerful mathematical thinking, but creating time and space in a classroom to discover that thinking is difficult in all settings. We all face pressures on time in our classrooms. Whether it’s from looming standardized tests or strict syllabi requirements, teachers at all levels of mathematics education feel rushed and pressed for time. The time spent during these two Saturday mornings did not fix this problem–but it did give me a deeper respect for the challenges faced in math ed across a students’ education. Both of these events also gave the practitioners present time to reflect on their teaching and to ask questions of one another, reminding all of us that we can learn from each other just as our students can learn from their peers. Doing math with colleagues is incredibly powerful: My favorite part of both of these events was the time spent actually doing math together. At the elementary PD, Teddy Chao and Melissa Adams led us through solving a three-act task: We started by looking at pictures of different types of animals and discussing what we noticed and wondered about them. Samari collects lizards and beetles. She has 8 creatures in her collection. All together they have 36 legs. How many beetles does she have? How many lizards does she have? Then we were given time to work through the problem. I immediately set up a system of equations and solved it. While I was pretty proud of using a technique that I teach my own students, I quickly saw from the other teachers that this wasn’t the most elegant way of solving this problem. Teddy led the groups through the process of sharing out different strategies. When we shared out the different strategies, I saw several simple and elegant ways of approaching the problem that my experience had blinded me to. I also noticed that the teachers were excited about all of the different ways to solve the problem. The conversation at my table quickly turned to the different ways they would use this task or something similar with their students. After working through this problem, Melissa shared video of her past students engaging in similar problem-solving exercises. While these videos would have been powerful before working through the problems, doing similar problems ourselves really helped to be in the mindset of what the act of problem-solving looks like. The sequence 1, 3, 2 has the property that the average of the first two entries is an integer and the average of all three entries is an integer. Given any list of positive integers, is there a way to rearrange them so the average of each initial segment of integers is itself an integer? I observed that each of the three groups working together on this problem took a different path. As a group they each worked to further define their problem and set their own goals. When we shared out, each group had something distinct and important to share with the entire group. Chris also led us through the Parable of Polygons. Again, during this time I heard groups working to define the problem, set their own goals, and then work to discover solutions. I also saw Chris go around and ask each group to explain their thinking–something that college faculty are not usually asked to do when solving a math problem! After working on this problem for some time, we talked as a group. One of the major takeaways that I saw was the power of the type of questions Chris asked the participants to answer while they were problem-solving. One of the tutors said that she really appreciated seeing these types of questions modeled and that she would try to use similar questioning strategies when helping students in the math learning center. We had a great discussion about types of questions useful to pose to students during problem-solving. It would have been possible to only talk about problem-solving in the classroom from a teacher’s perspective in both of these cases. However, I think the discussions became deeper after we had put ourselves in our students’ shoes and worked at problems ourselves. The last thing I noticed at both of these events is how nice it is for teachers to get together, share some coffee and donuts, and have time to reflect on our practice. I suspect that this is often difficult for the elementary teachers to really talk to each other before or after school without having many other things on their minds. Many of the faculty and tutors at the two-year college do not see each other except for events like this. I’m so glad that I got to attend both of these events in such a short amount of time. It helped me think about math ed as a whole rather than at specific grade-levels. What have you seen as most important during a math professional development? What do you most gain from them? Special thanks: Thank you to Teddy Chao and Melissa Adams for inviting me to their PD event. Also, thanks to Chris Bolognese for taking the time and coming out and leading the Math Teachers’ Circle. Thanks so much for these great observations and thoughts, Emily. I really loved having you be a part of the PD that Melissa and I got to do. One thing I’m always learning is that teachers always have amazing strategies, but don’t always have the time to delve deep into those strategies or talk about them. I think you’re absolutely right that finding a space (and providing snacks!) is key to getting teachers to engage in thoughtful collaboration! Leave a Reply to Teddy Chao Click here to cancel reply. ← Where did I come from and where am I going?